At R.C. Cook Insurance we take the time to understand the operations of our clients and try to put together an insurance program that best suits their needs. No matter if you are an individual or a small to medium size business, we treat all our clients with the same respect and attention. We put protection and service ahead of price. We believe that our customers are part of our family and that you should prioritize life by God, Family and every thing else. We strive on our ability to continually surpass our client’s expectations. We are a company of people with a single-minded commitment to Customer Satisfaction. It is this attitude that makes R. C. Cook Insurance stand out as a leader within the insurance community. And it is this attitude that can be seen in the quality of the services we provide to our customers. We always strive to build relationships by exceeding expectations. Our group of insurance professionals are among the most experienced in the industry. Importantly, our business model allows them to dedicate the necessary senior-level attention to clients. If you are a commercial, business, personal or organizational client, or provide a personal service, you can benefit from our expertise. R.C. 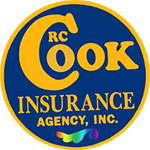 Cook Insurance Agency serves the personal and business insurance needs of individuals, families and businesses in Ohio.